NASA's Aqua satellite found a thick ring of powerful storms around Hurricane Isaac's ragged eye and southwest of center on Sept. 10. Infrared satellite data at 12:15 a.m. EDT (0415 UTC) on Sept. 10 from the Moderate Resolution Imaging Spectroradiometer or MODIS instrument aboard NASA's Aqua satellite revealed powerful storms circling Isaac's center and in fragmented bands southwest of the center. In those areas, MODIS found coldest cloud tops had temperatures near minus 70 degrees Fahrenheit (minus 56.6 degrees Celsius). NASA research has found that cloud top temperatures that cold have the capability to generate heavy rainfall. 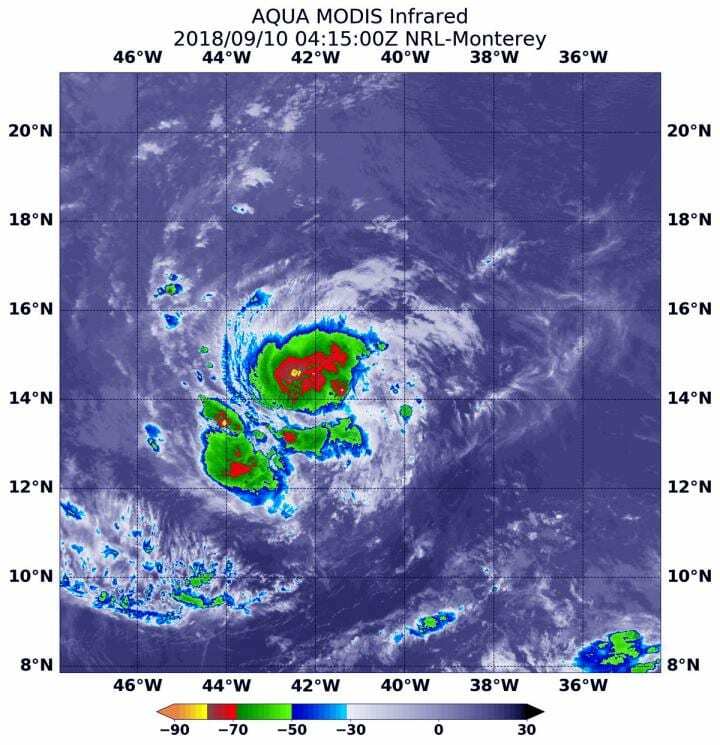 The National Hurricane Center observed "Isaac's cloud pattern is currently a bit ragged-looking, with an irregular central dense overcast and limited convective banding [of thunderstorms]." At 11 a.m. EDT (1500 UTC), the National Hurricane Center or NHC noted the center of Hurricane Isaac was located near latitude 14.7 North, longitude 43.9 West. That's about 1,150 miles (1,855 km) east of the Windward Islands. Isaac is moving toward the west near 14 mph (22 kph). A westward motion with a slight increase in forward speed is expected through the end of the week.